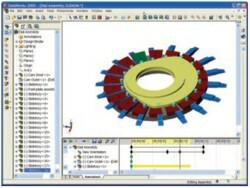 SolidWorks® Animator software is an easy-to-use solution for creating effective animations of 3D CAD models. SolidWorks Animator is the first and only animation tool that is fully integrated with SolidWorks, the standard in 3D mechanical cad software. Speed the review of product designs and reduce time-to-market. Create animations that you can email quickly or publish on the web. 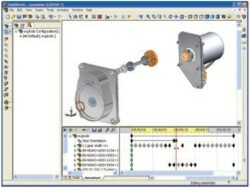 SolidWorks Animator enables you to create compelling AVI (Audiovisual Interleave) files from SolidWorks parts and assemblies, allowing you to communicate design concepts and collaborate more effectively with anyone who has a PC. Animation is a powerful tool for communicating design engineering concepts. In the past, the high cost and time required to learn animation software made it impractical for most designers and engineers to adopt. 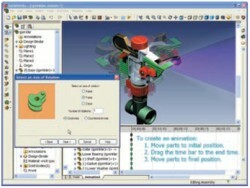 Now you can develop exciting animated images easily and economically using SolidWorks Animator. Generate animations effortlessly from SolidWorks parts and assemblies using the point-and-click Animation Wizard. Capture assembly motion instantly to show how moving parts of an assembly will interact. Explode or collapse an assembly to demonstrate how the components of an assembly will fit together. Fly around a model or revolve it 360° on a turntable to show what it looks like from every angle. Simplify development of sophisticated animations with enhanced controls for explode and collapse functions as well as pacing. Turn around product design changes fast and shorten development cycles by circulating design AVIs for review via email. SolidWorks Animator is seamlessly integrated with SolidWorks and PhotoWorks™, allowing you to easily take advantage of the unmatched solid modeling capabilities of SolidWorks and photorealistic rendering features of PhotoWorks. Create photorealistic effects by means of sophisticated ray-traced lighting effects and the ability to define material properties and apply materials to parts and features. Demonstrate the results of any add-on applications that provide single-window integration with SolidWorks, including Certified Gold software solutions from SolidWorks Solution Partners.